When first starting the Electronic Order Pad, you will be presented with the Sign In screen in order to log onto your entrée.NET server. Each DSR will have been assigned a unique Username and Password. Once the DSR signs in, the Electronic Order Pad will know all the details about their assigned customers, commission formulas, etc. Note that you can touch the "Remember Me" button (the checkmark will become highlighted) and the Electronic Order Pad will remember the Username and Password for the next time the DSR sign's in. If the DSRs tablet ever becomes lost or stolen, simply change their Username and/or Password to provide unauthorized access, as no data is stored on the device. You can select the Customer Account Inquiry menu option to view a customer's accounts receivable status. At the top of the screen is displayed the customer's Credit Limit, Current Balance, Available Credit, Last Payment Date, Last Payment $, Last Check #, Last Invoice Date, Last Invoice $ and Last Invoice #. Next displayed is a 5 period aging summary broken down by days with a bar graph to let the DSR visualize the dollar amounts open for each of the aging periods. 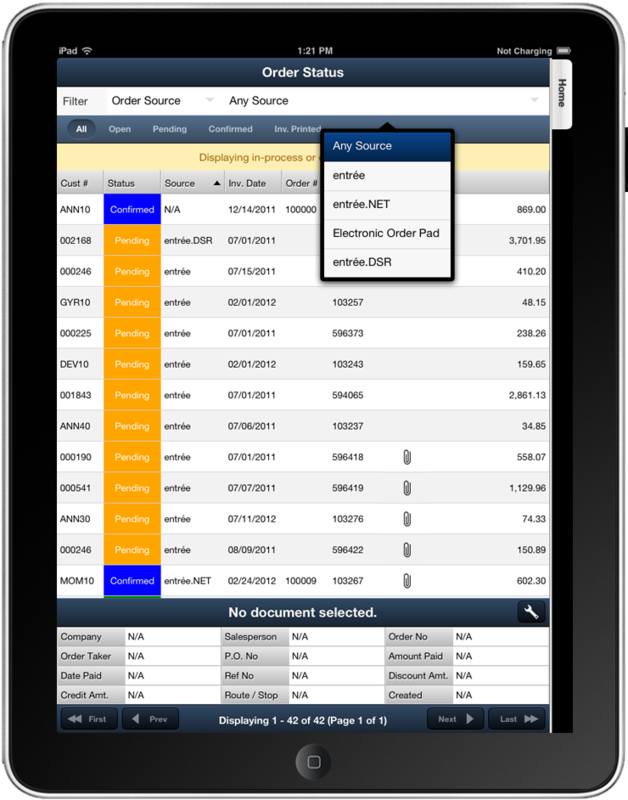 The final part and major part of this screen displays a grid to show in detail the customer's accounts receivable, listed by invoice and sorted on any column. This information includes the "Invoice Status Code" or "Stat" which includes "NE" for Non-Extended invoice, "CM" for Credit Memo, "OP" for Over Payment, "BC" for Bounced Check, "FC" for Finance Charge, or "CF" for Bounced Check Fees. The Customer Shortages option allows your DSR to be aware of and view shortage information from customer invoices. This feature will make it easier to take care of shortage situations with customers early and avoid losing sales. Only orders that have been submitted to the main entrée system and have been printed as an invoice are used when generating shortage information. When the Quantity Shipped is less than the Quantity Ordered it is interpreted as a shortage. The "$ Lost" because of shortage is displayed per line item and the "View Invoice" button shows the entire customer invoice. The Order Status screen display's information for all printed and unprinted invoices from the main entrée system making all your DSRs orders visible and manageable. 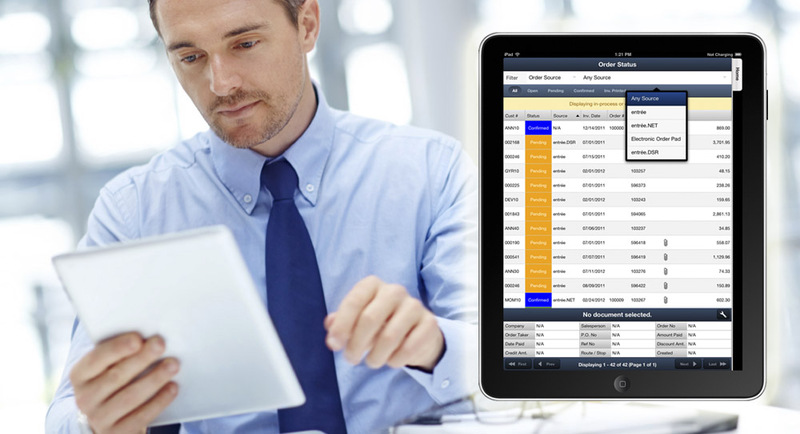 This also allows them to see exactly where any of their orders stand throughout the order entry to printed invoice process. Status indicators include "All" (displays all in-process or completed orders), "Open" (displays online orders that have not been completed), "Pending" (displays completed online orders that are waiting to be imported into entrée), "Confirmed" (displays online orders that have been imported into entrée) and "Inv. Printed" (displays orders which have been printed as a completed invoice in entrée). 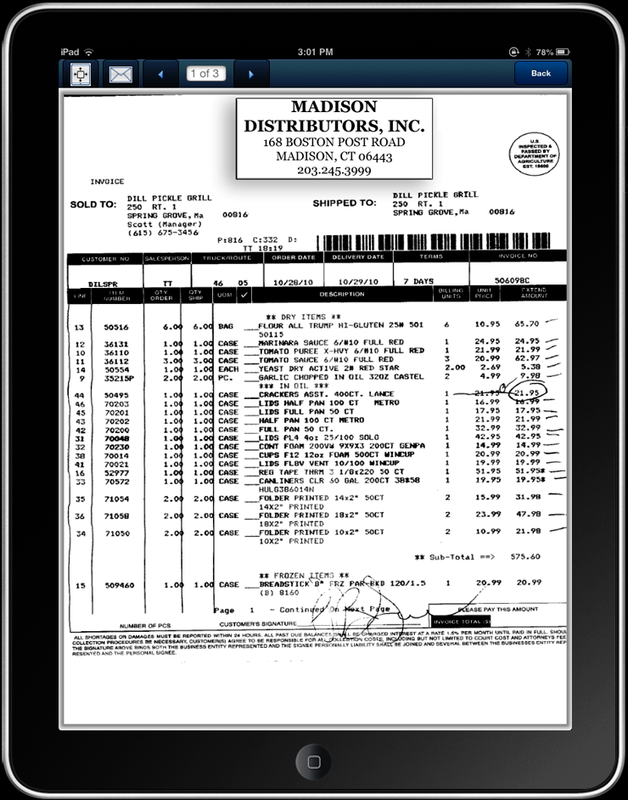 Food distributors using the entrée.DOC (document scanning) software option, will see a paper clip icon which indicates to your DSR that a scanned image of the invoice document is available for viewing. Touching the paper clip icon will display the scanned invoice on the screen. This icon is located in key areas throughout the Electronic Order Pad. Just tap the paper clip to view the scanned invoice. There are a few tool icons at the top of the screen including an email icon which will allow you to send the scanned invoice as a PDF document to a desired email address.